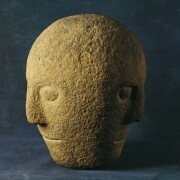 The Corleck Head dates from the early Iron Age, 1st to 2nd century A.D. 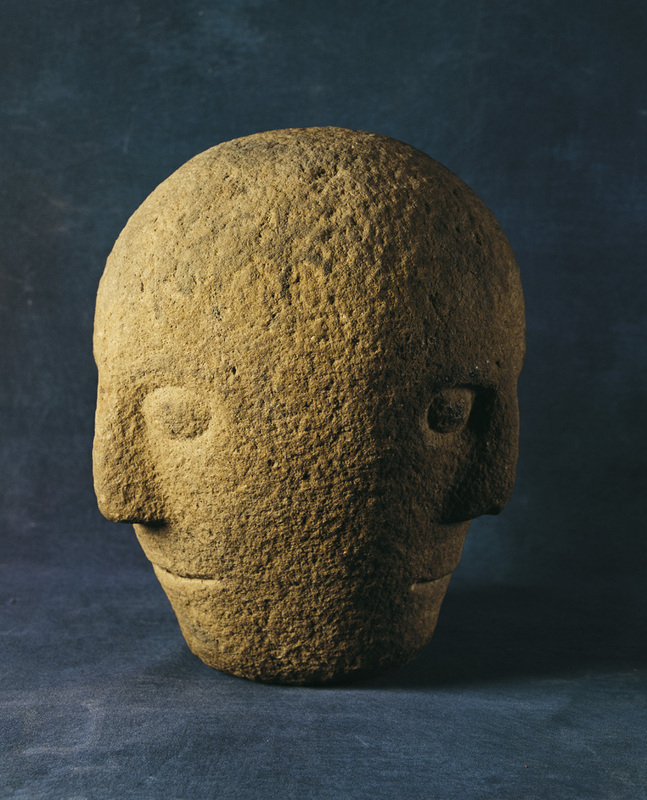 It is a stone sphere described as ‘an elegantly carved stone with three similar faces’. It is one of the oldest artefacts originating from the Bailieborough area and it is housed in the National Museum, Dublin. The head was named after the townland where it was discovered Corleck, located in the Parish of Knockbride, just 6.4 km. 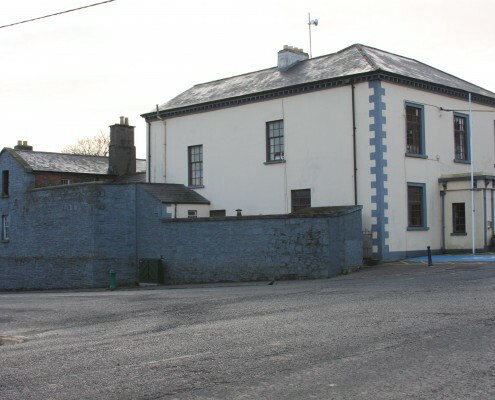 (4 miles) from Bailieborough town. 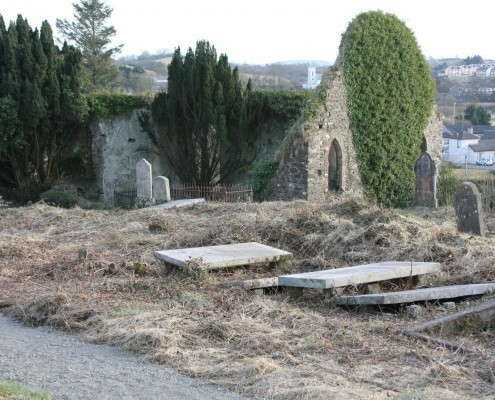 The ruins of the first Parish Church is the oldest building in Bailieborough. Within its burial ground are many of the earliest inhabitants of the town. 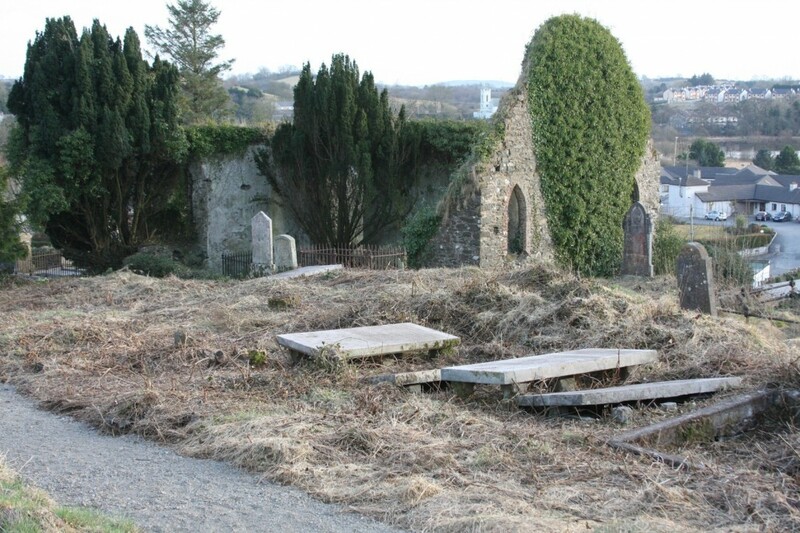 Of note in the foreground are the graves of the James Family, ancestors of the renowned Henry and William James. 1610 William Bailie a native of Aye in Scotland, was given 1000 acres of land in Toneregie in the Barony of Clankee, which was later known as Bailieburrow. He was known as an undertaker, the land was given to him under certain conditions. These conditions specified that within two years he undertook to erect a house and bawne for himself, build houses for his tenants and collect rents from them. The annual payment he was liable for to King James I was reduced somewhat if he settled Scottish tenants on his lands. He had to provide and store some blunderbusses and muskets so he could arm a number of men. A condition required every undertaker to take what was called an ‘Oath of Supremacy’ which swore allegiance to the King as supreme ruler in both Church and State. 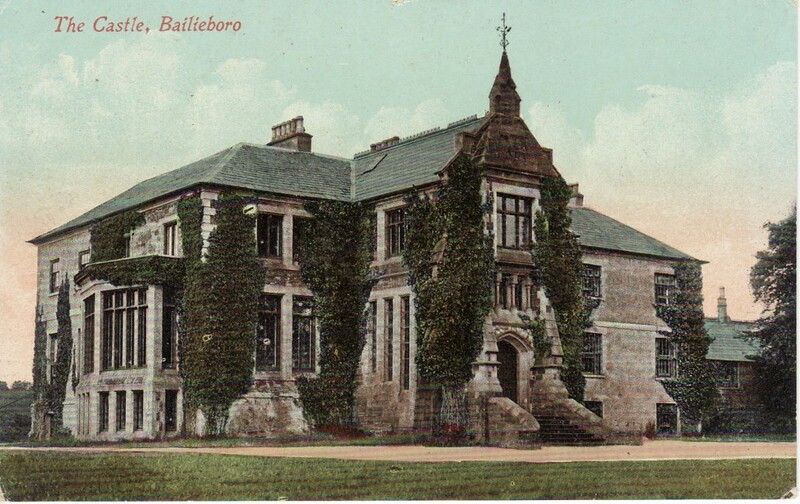 1613 William Bailie had constructed a castle and when completed it was known as the ‘Manor of Bailieburrow’. It was described as situated in a fine demesne one mile to the north of the town, occupying the site of an ancient fortress and castle. Captain Pynner in his 1619 report wrote: ‘‘Upon this property there is a bawne of lime and stone 90 feetsquare, with two flankers and in one of the flankers there is a castle the length of it is 30 feet and the breath 22 feet being vaulted. There is another house at one of the corners, 20 feet square also vaulted’’. 1626 A report recorded that the town had houses built of wood and covered with straw thatch. 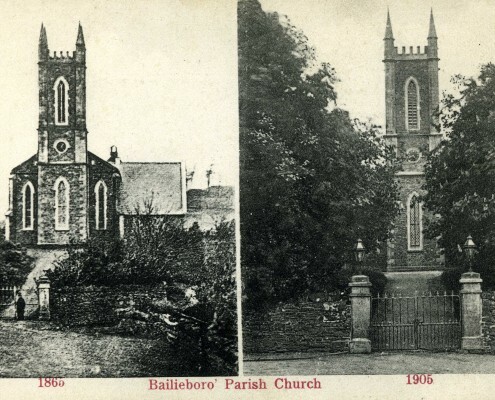 During William Bailie’s tenure the town spelling became Bailieborough, named after Mr Bailie or otherwise Bailie’s Borough. The Barony of Clankee was recorded as being much forward as an example of thrift and good management. The first settlement was located around the gates of the castle on the Cavan Rd. This settlement was deemed unsightly by the inhabitants of the castle so it was removed to an area around the old Church of Ireland. Initially this hamlet was called Kilcollie and the dwellings there were of wood with thatched roofs. This area was found to be an exposed location so again after some time the hamlet moved to the town’s present location. 1685 The estate passed to another Scotch man named Hamilton who in turn sold to a Colonel Stewart and from there passed on to Stewart Corry of Rockcorry, Co.Monaghan. During the period leading up to the 1798 Rebellion the castle grounds were used for military training by rebels. Part of the plantation was cut down to make pike handles and the adjoining hill where the rebels trained became known as ‘Rebel Hill’. 1814 The estate and the castle was sold to William Young after he returned from the East Indies. 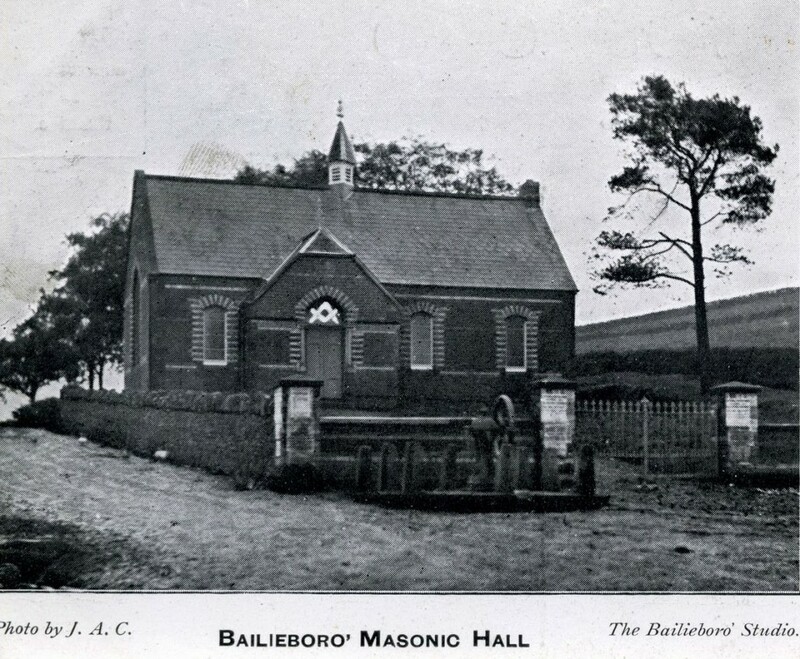 That same year he developed the new town of Bailieborough laying out the present Main Street with new houses described as solid stone structures with slated roofs. 1817 The Courthouse was erected, with the addition of the Bridewell Jail in 1833, for the use of the inhabitants of Co. Cavan. The jailer and his family lived on the first floor above the detention cells. 1818 The Market House was built; it replaced an older market house which was located in the centre of Main Street between the Bank and the Post Office. 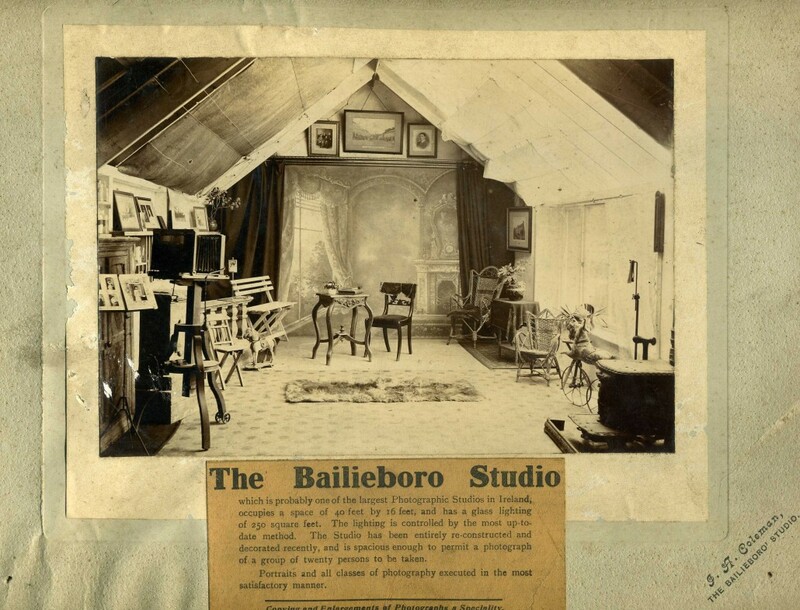 The photograph shows an early image of the Market House now Bailieborough Library. 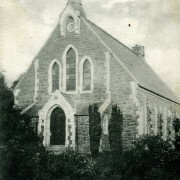 1833 Work commenced on a new Parish Church and was completed in 1835. The then Rector was Rev John Gumley. This Church replaced an older Church now in ruins the date of the construction of this older Church is unknown. The transept was added to the north side of the Church about 1864 when Rev Thomas Jackson was rector. The adjoining Parochial Hall was built in 1871 and in 1875 the bell was erected in the belfry. One of the stained glass windows is a memorial to Lord and Lady Lisgar whose remains are interred, in the family vault of the Young family. Another stained glass window is a memorial to the James Family. 1839 St. Anne’s Roman Catholic Church was erected in 1839 when the Very Rev. Philip O’Reilly VF was Parish Priest. This building replaced an older Church near to this site which was described as a long thatched Chapel, it was built during the late 1700s. In 1851 the tower and belfry was added during the ministry of the Very Rev. Matthew Mc Quaid VF. Between 1868-70 the Very Rev Francis O Reilly DD VG overseen the building of the chancel, baptistery and the sacristy. The marble altar is dated 24th December 1895. The Stations of the Cross were painted by the renowned Irish artist George Collie in 1956. 1833 A Methodist Church was built at the end of Adelaide Terrace. This street is named after Adelaide Annabella Baroness Lisgar. When the Church closed it became a privately owned Arts and Cultural Centre..
1840 Tandragee House was erected initially as a fever hospital by Sir John Young. It later became the residence of Thomas Chambers his agent who administered his estate. It was also the home of Mr Isaac Broome J.P., it is now privately owned. 1847 A Model House was erected as an Agricultural Training School with suitable offices and a 48 acre farm attached. It was a training school where eight pupils boarded and were taught both the theory and practise of modern and scientific methods of farming. It was demolished to make way for a new technical school. 1848 The Model Schools were erected in 1848 the building of which was funded by Sir John Young. These schools were divided into separate boys and girls schools with an infant’s section added at a later date. There was no distinction of class or creed and this lasted until 1885 when the Catholic pupils withdrew and subsequently attended the new St. Ann’s School just across the road from the Catholic Church. 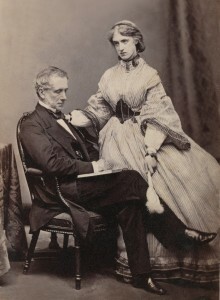 1870 Sir John Young received a peerage and gained the title Lord Lisgar, his estate became known as the Lisgar Estate. He was born in Bombay in 1807 and in1835 he married Annabella Dalton. He was M.P. for County Cavan 1831-1855 and founder of the Anglo-Celt in 1846. He became Chief Secretary of Ireland in 1852. In 1855 he was appointed Lord High Commissioner of the Iona Islands. In 1861 he was appointed Governor General and Commander in Chief of New South Wales and in 1868 he was appointed Governor General of Canada. 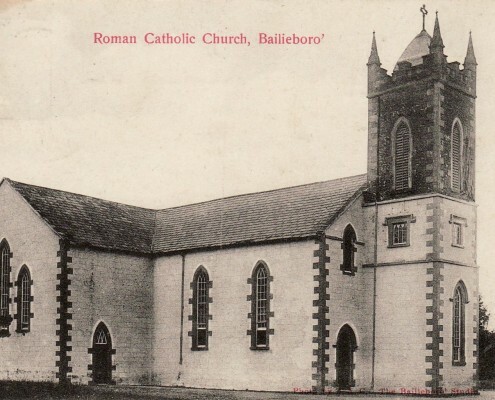 He retired in 1872 and returned to live in Bailieborough Castle where he died in 1876 aged 69; he and his wife are buried in the Church of Ireland graveyard. His wife, Lady Lisgar survived him by 19 years, they had no family. 1878 The Institute was built by First and Second Bailieborough Presbyterian Churches as an institute for the education of boys in the faith. In 1903 it was acquired by the Masonic Order and it continues to be a meeting place for Lodge 796. 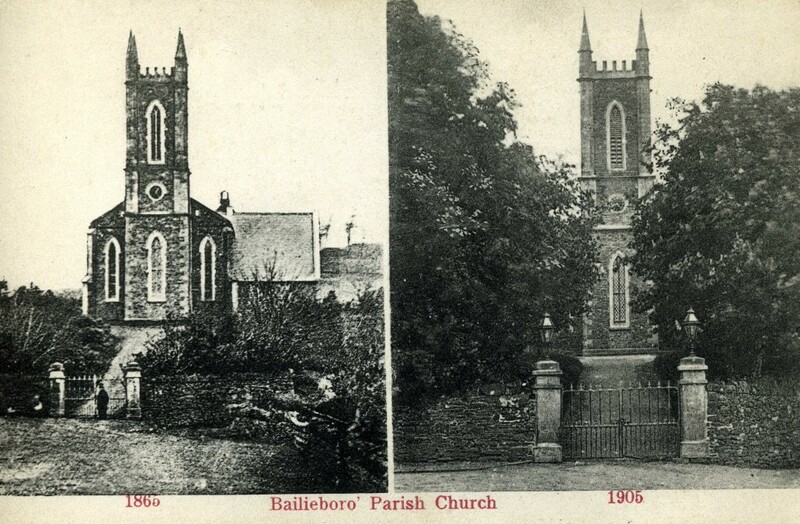 1878 The Parish of Bailieborough was formed by act of Council when several townlands were separated from the old Parish of Killan uniting them to the Parish of Moybolgue, otherwise known as Bailieborough. 1886 St. Anne’s National School was built across the road from the Roman Catholic Church for the education of pupils who had previously been taught in the Model Schools. This new Catholic School had two classrooms and the headmaster was Master McGovern. 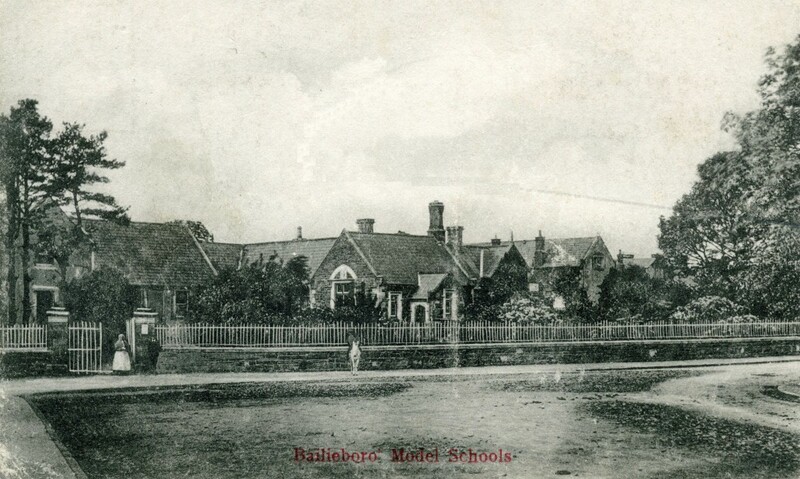 By 1928 it had become too small for the growing population and the boys relocated to two rooms in the Model School. In 1998 the building was demolished and six houses were built on the site now known as ‘Waterfront’. 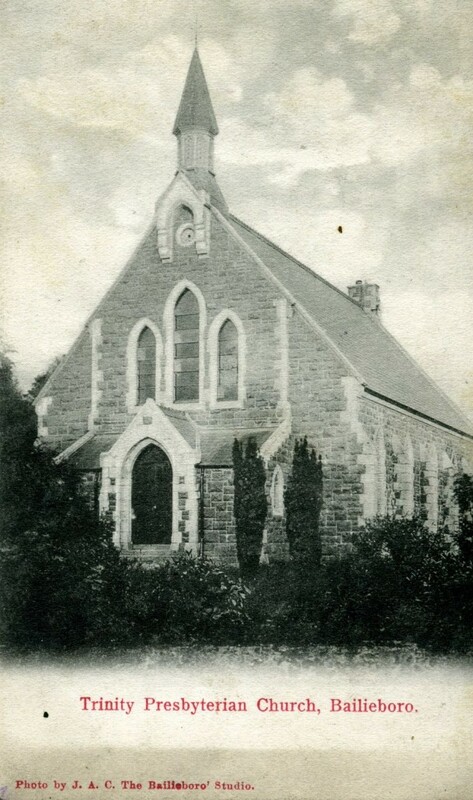 1887 Trinity Presbyterian Church was built to replace an older Church in the townland of Urcher which had been erected about 1770. 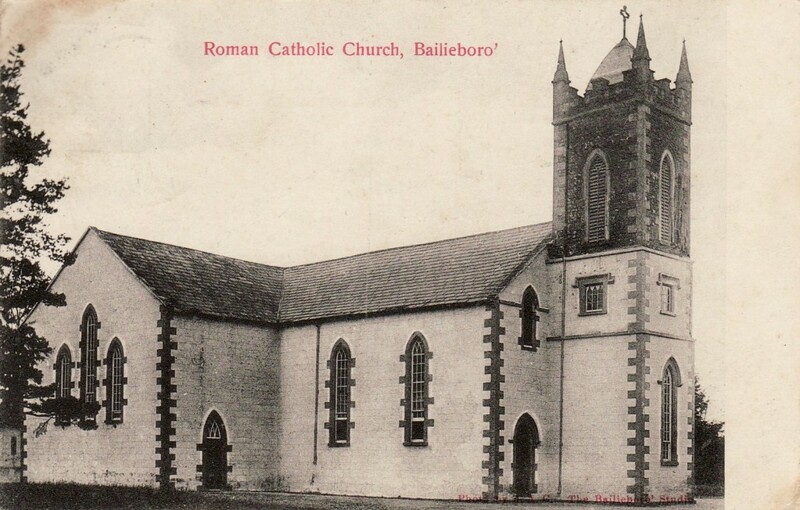 This older Church was known as 2nd Bailieborough and is now demolished with just the graveyard remaining. The Rev Thomas Johnston was Minister when Trinity Church was built. 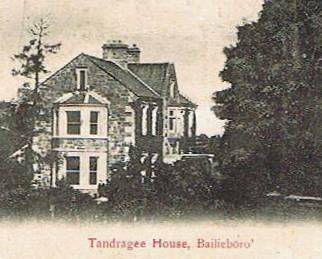 1900 On November 14th 1900 the Estate of the trustees of Adelaide Annabella Baroness Lisgar which had been divided into 82 lots was sold by public auction in Dublin. The Department of Agriculture purchased 404 acres of the estate for forestry purposes. The Marist Brothers purchased the castle but in 1918 a large part of the castle was accidently destroyed by fire and the Brothers had to abandon the building. Some time afterwards and the building was demolished. 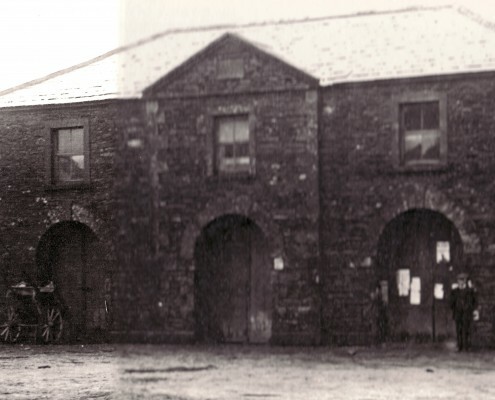 1902 Bailieborough Central Co-Operative Creamery was established. Its origins trace back to the Millmount Dairy at Crochnahattina which was run by Mary Simpson. A new creamery was built in 1903 costing £559 on land donated by Mr W. Smyth, it opened to receive milk in 1904 and had a daily intake of 350 gallons. 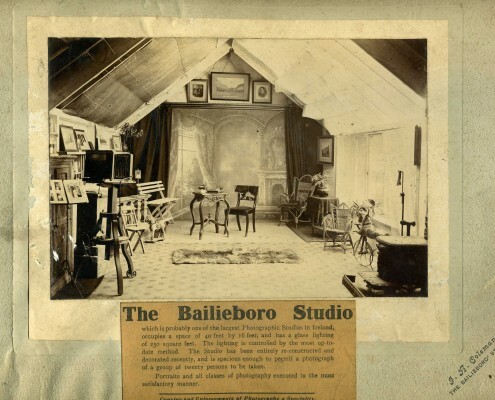 1904 The Bailieborough Studio was established by James A. Coleman M.P.P.A. It was one of the largest photographic studios in Ireland boasting glass lighting of 250 square feet controlled by the most up to date methods. It was re-constructed in 1913 and then had an area capable of taking a group of twenty or more persons. Many of the photographs reproduced in this history section are from the ‘Coleman Collection’. 1927 The Hibernian Bank was built on Main St., now known as the Bank of Ireland. 1933 A Vocational School was opened in three rooms of the old Workhouse. It had just three staff and remained in this building until the end of 1938 when it transferred to the Model House. A decision was made to demolish the Model House and erect a New Vocational School on its site. Teachers and students again transferred to rooms in the Model School during the building of the new Vocational School. 1958 St. Ann’s National School (as we know it today) was built and dedicated to St. Ann the patroness of the Parish of Killann. It was a six-room school and has since been extended and modernised over the years. 1964 Lourdesville Secondary School was opened by the Presentation Sisters close to their Convent. They provided education for students up to and including the Leaving Certificate under their Headmistress Sister Christine. 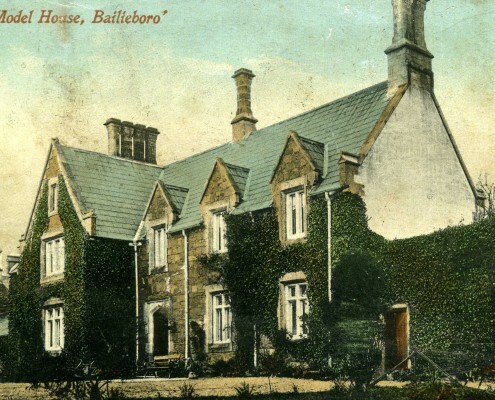 1965 Bailieborough Vocational and Technical School (The Tech) was opened to accommodate 80 pupils and had five classrooms; the then headmaster was Mr Liam Kelly. 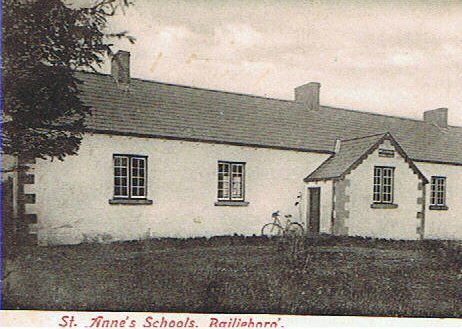 1981 Bailieborough Community School was officially opened; it replaced both Lourdesville Secondary School and Bailieborough Vocational School. 1999 Bailieborough Swimming Pool and Leisure centre was officially opened by Dr. James McDaid T.D. He was assisted in the official opening by Mrs Sheila Germaine and Mary and Paddy Kelly, their financial assistance together with community fundraising and Government funding made the project possible. We now have a facility which is the envy of many larger towns in Ireland. 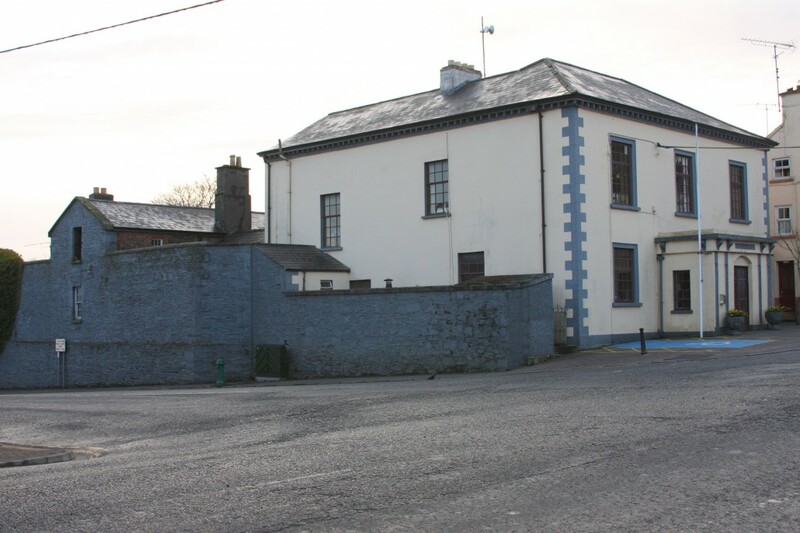 2001 Bailieborough Fire Station was officially opened by Minister Noel Dempsey,it replaced an older fire station on New Road. 2009 Bailieborough Business Centre, Shercock Rd., was officially opened by President Mary McAleese. The building of this modern facility was made possible by a forward thinking committee and Government Funding Agencies. It is a community owned enterprise overseen by a cross community board of directors. 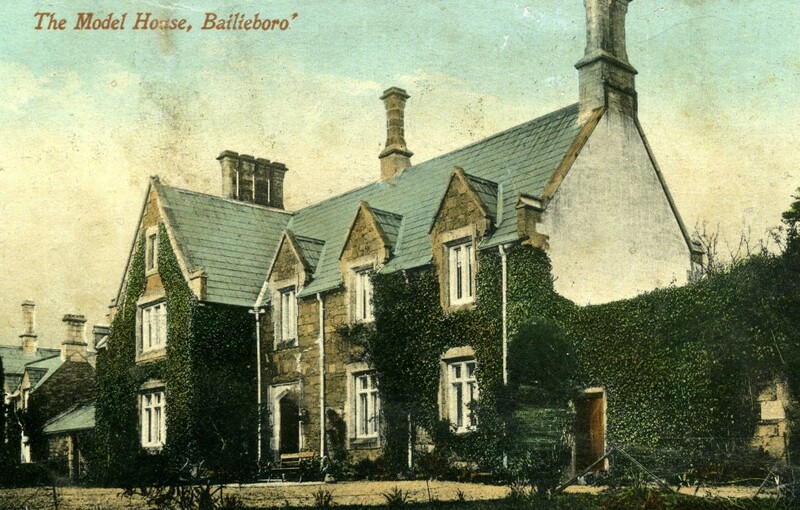 2010 Bailieborough Resource House was the most recent public building erected in Bailieborough. Information & images kindly supplied by local historian & author Leslie McKeague.